The i-button data loggers are ideal for applications where a non-intrusive data logger is required or where the available location precludes the use of any larger data loggers. These loggers are available in a number of temperature ranges to enable them to be used in a variety of applications including food, pharmaceutical or environment/conservation monitoring. A unit is also available which can monitor Humidity as well as Temperature. A range of accessories is available to aid mounting, identifying or waterproofing the loggers. If you need any assistance in choosing the appropriate device for your specific application contact us. Miniature i-button Temperature Data Logger (-40 to +85°C @ 0.5 °C accuracy), capable of recording up to 8000 8-bit measurements or 4000 16-bit at intervals from 1 per second. Miniature i-button Temperature Data Logger (-40 to +85°C @ 0.5 °C accuracy), capable of recording up to 122k 8-bit measurements or 61k 16-bit at intervals from every 5 minutes. Miniature i-button Temperature Data Logger for monitoring the range 0’C to +125’C. Able to log from rates of once per second and store up to 8000 8-bit measurements. Miniature i-button Temperature Data Logger (+15 to +140°C @ 1.5 °C accuracy), capable of recording up to 8000 8-bit measurements or 4000 16-bit at intervals from 1 per second. Miniature i-button® Temperature and Humidity Data Logger for monitoring the range -20’C to +85’C and 0 to 100% RH. Able to log from rates of once per second and store up to 8000 8-bit measurements. USB to 1-wire Interface to connect to iButton Reader Cables and Probes. Interface Cable with Blue-Dot Receptor, to connect to RJ-11 port of the DS9490R Adapter. Touch and Hold Probe for use with iButton Data Loggers (Thermochron & Hydrochron). 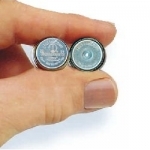 Capsule for iButton® F5 series Loggers to protect against moisture, solvents and pressure. Wall / Panel Mounting Flange for Thermochron and Hydrochron iButton Loggers®. Pack of 10. Angled Fob for mounting the Miniature Data Loggers (Pack of 10). Metal Half-enclosure to protect a Thermochron Data Logger for fluids, while maintaining the fastest possible temperature response. Floating Silicon Enclosure with handle, suitable to protect all Thermochron loggers from water ingress (suitable to 5m depth/0.5bar pressure. Lightweight Silicon Enclosure suitable for all Thermochron Data Loggers, to protect from water ingress (up to 5m depth or 0.5bar pressure.